Righteous people have a way of blessing others with their words. It may be their word of encouragement, their carefully chosen speech, their advice full of wisdom, their message of comfort, their truth in teaching, or their faithfulness to their promises. No matter what form, the words of righteous people are a blessing. But fools don't listen to the righteous. They plot their own course refusing truth, wisdom, and godliness only to find their lives lost to meaninglessness and folly. 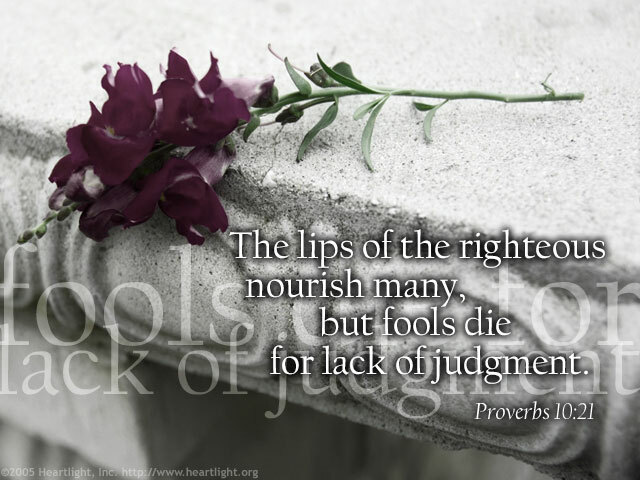 Father God, Author of all truth and wisdom, please give me the ability to discern those around me who are truly righteous and the wisdom to listen to what they say. Please help me avoid the pitfalls of pride and arrogance as I humbly seek to hear your truth in those whose lives are conformed to your character. In Jesus' name I pray. Amen.